Sushi Murasaki is located along the stretch of Japanese restaurants on level 2 of the Japanese Food Street at Millenia Walk. 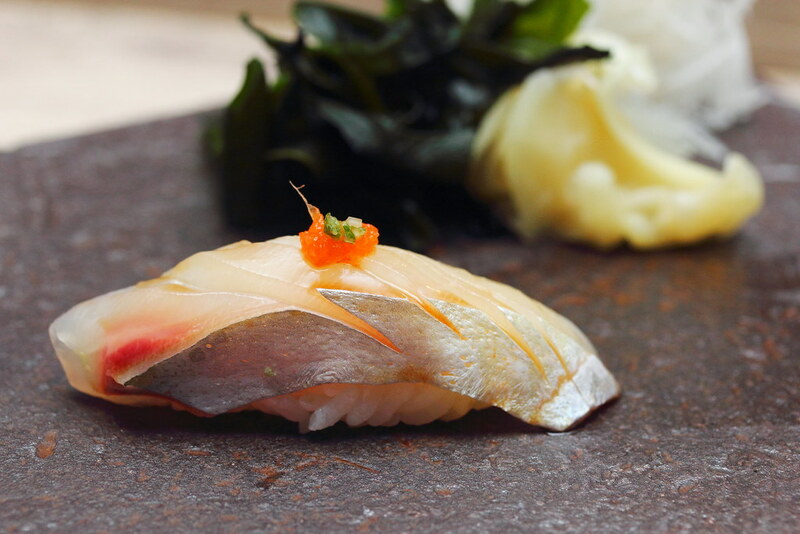 Sushi Murasaki specializes in omakase dining concept showcasing seasonal fish freshly flown directly from Japan's famous Tsukiji Fish Market. I had the Kumo Omakase ($180) which comes with 2 appetizers, 3 kind of sashimi, 6pc nigari sushi, mini premium don, signature soup and dessert. 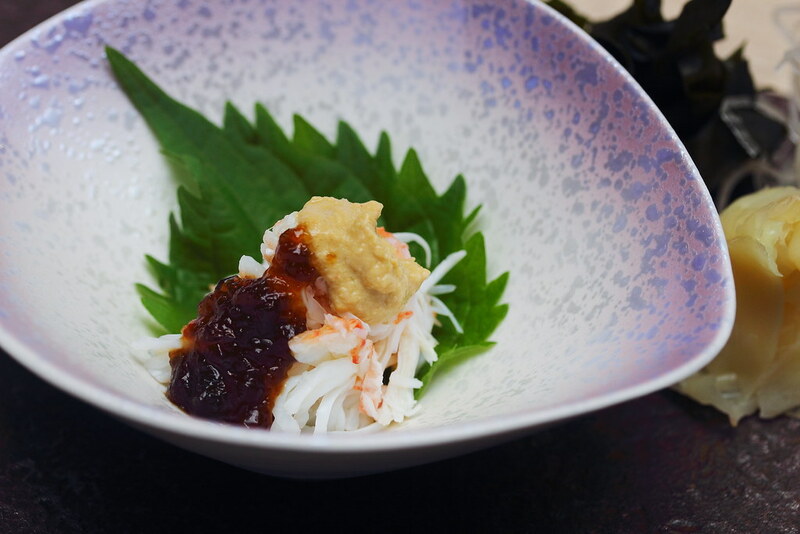 The omakase dinner started with the seasonal Hairy Crab known for its sweet flesh and rich creamy roes. The crab meat has been de-shelled and topped with its roes and black vinegar jelly. Give it a good mix for the different components to come together. The Smoked Spanish Mackerel is lightly torched on its skin, filling the air with a nice smokey aroma. It is then topped with onion and ginger. A memorable enjoyment with the smokiness and saltiness complementing each other. 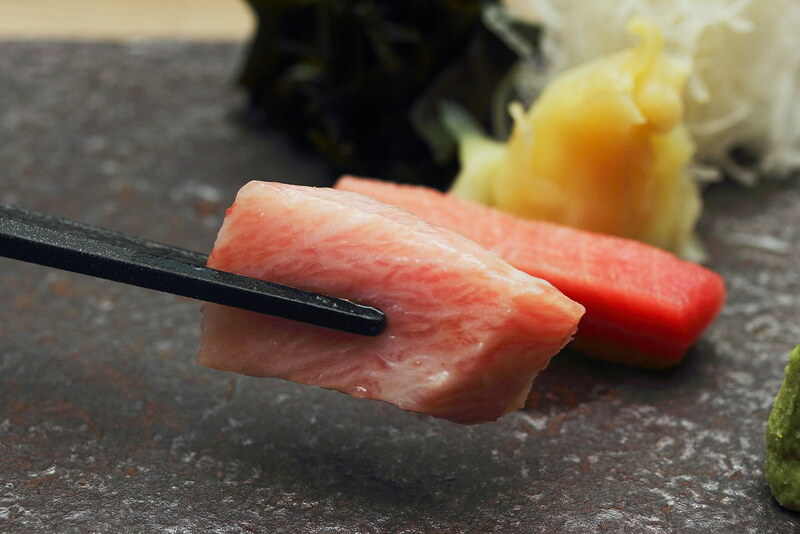 You can't really complain much when the Otoro and Chutoro are freshly flown from Japan and served in its original form. Fatty and melted in the mouth, this is simply heavenly. Another seasonal item we tried is the Tilefish. The dish showcases both texture and flavour. The deep fried skin and scales provide the crispy texture while the meat itself has a subtle sweetness. Initially I thought I was being served a bowl of soup until I lifted the lid. 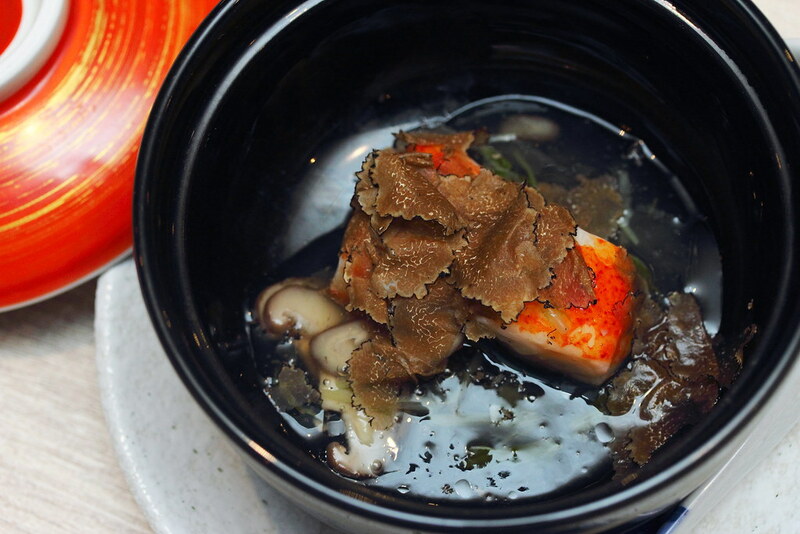 Inside the bowl, there are chunky pieces of Lobster meat in a mushroom based broth and topped with shaved truffle. It is a rather interesting combination using the earthy truffle to pair with the sweetness of the lobster meat. It took me a while to appreciate the combination. Moving on to the sushi, we started with the Shimaaji Sushi. The chef glazed the sashimi with soy sauce and then topped with roes and wasabi. 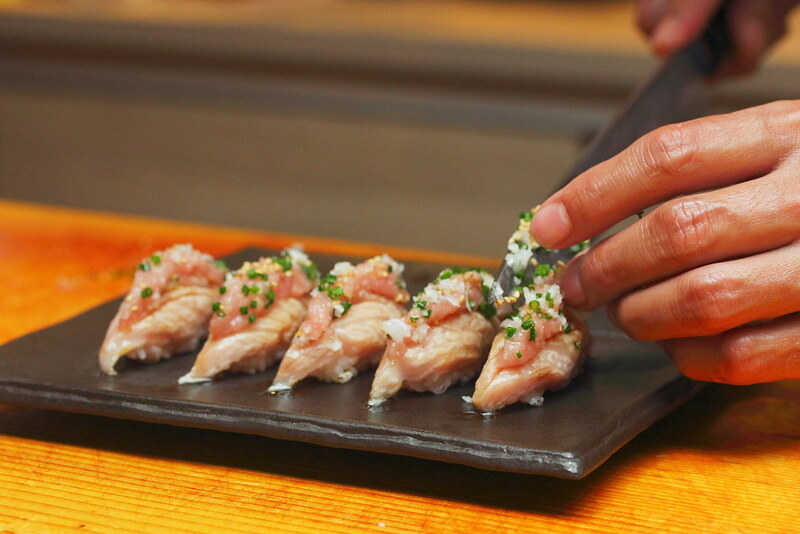 He even squeeze a bit of lime juice onto the sushi before serving. I enjoyed the lime part, I thought it help to liven up the sushi for a refreshing finishing. 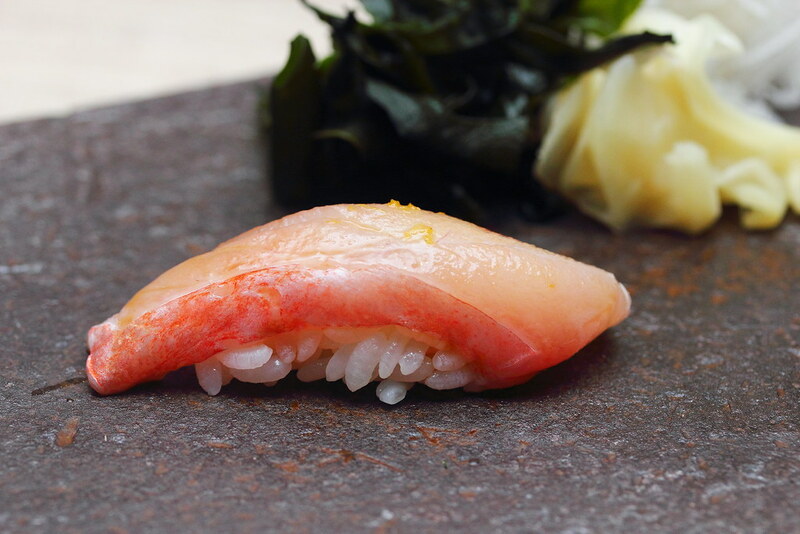 The Kinmedai Sushi is again glazed with soy sauce before topping with some yuzu shaving. I realized the chef likes to incorporate other elements onto the sushi to lift the flavour. It is a detour from the tradition way of appreciating sushi, which I think is a good approach while still preserving the basic. 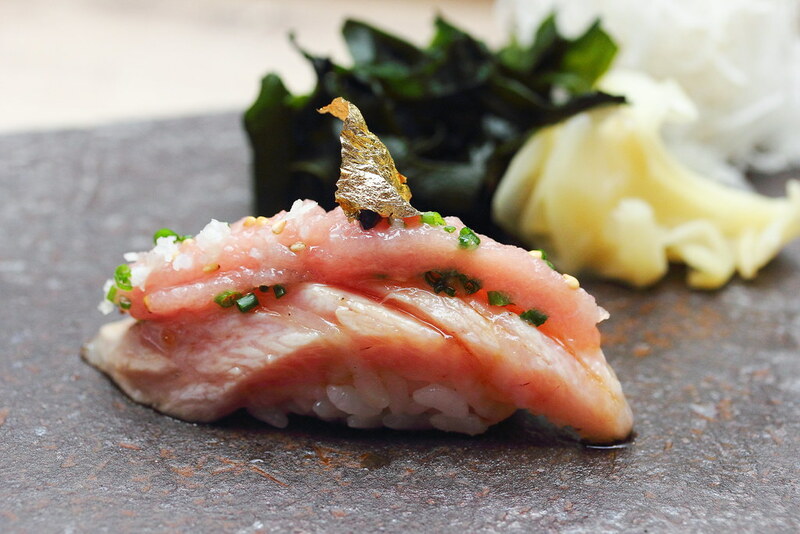 As I was seated at the counter, I could see how painstaking and delicately the chef prepared the Otoro Sushi which is topped with chopped tuna and edible gold leaf. 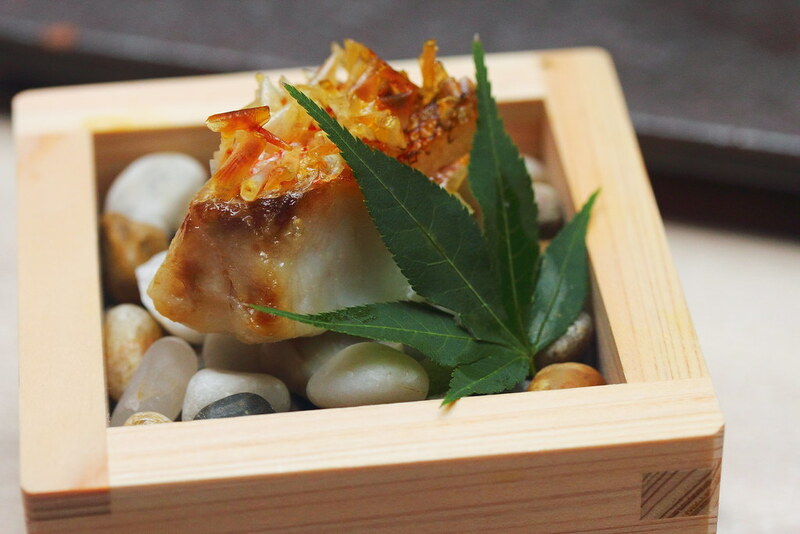 A luxurious piece of sushi that brought me to seventh heaven for its melted in the mouth texture and beautiful flavours. Creamy and creamier is how I would describe the Foie Gras and Uni Sushi. Never would I imagine the bold approach of the chef to substitute the tradition use of fish with foie gras and even adorned it with the premium uni. This is a heavenly combination that works perfectly. My only request is to reduce the sauce so as to allow the ingredients themselves to shine. It seems like the previous dish was just a teaser as I was served a whole parcel of Uni. 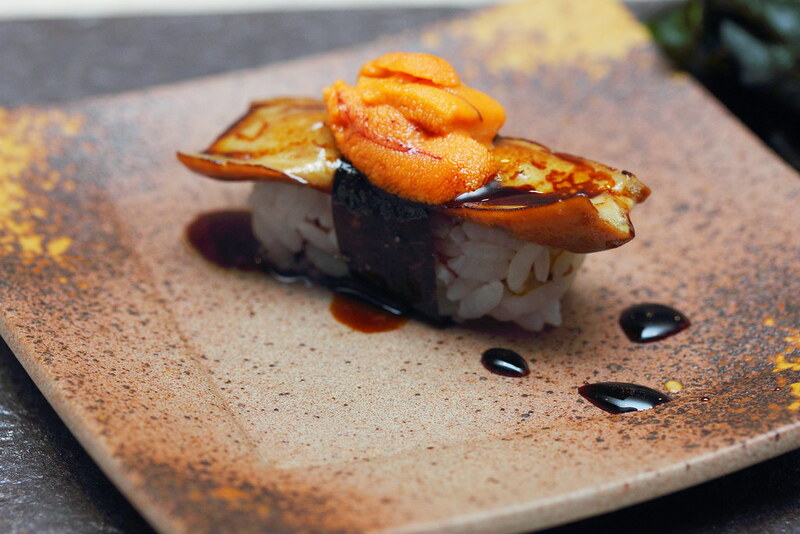 Among all the sushi, the Uni Sushi is the most traditional of all. 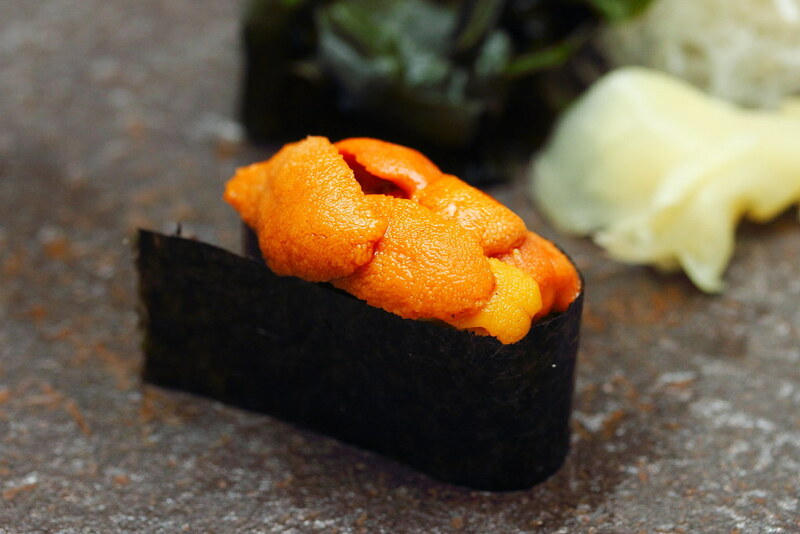 Just the main ingredient which is the uni and sushi rice, without other elements to boost the flavours. This is definitely the ultimate beef bowl. 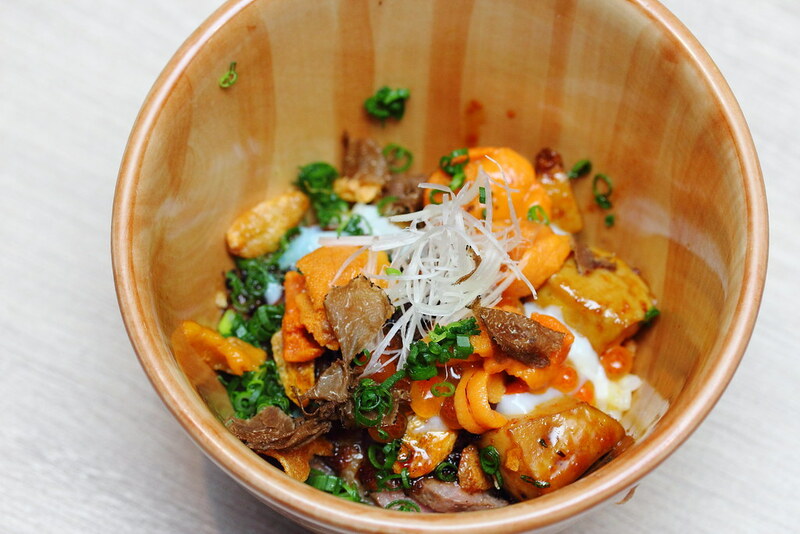 The Wagyu Don comes with uni, truffle, wagyu, onsen egg, foie gras and fish roes. You may think that this is just too much and too rich to be really enjoyed. The clever part is the bowl is served with garlic fried rice instead of white rice. The garlic fried rice played an important role of cutting through all the richness, providing the much needed balance. 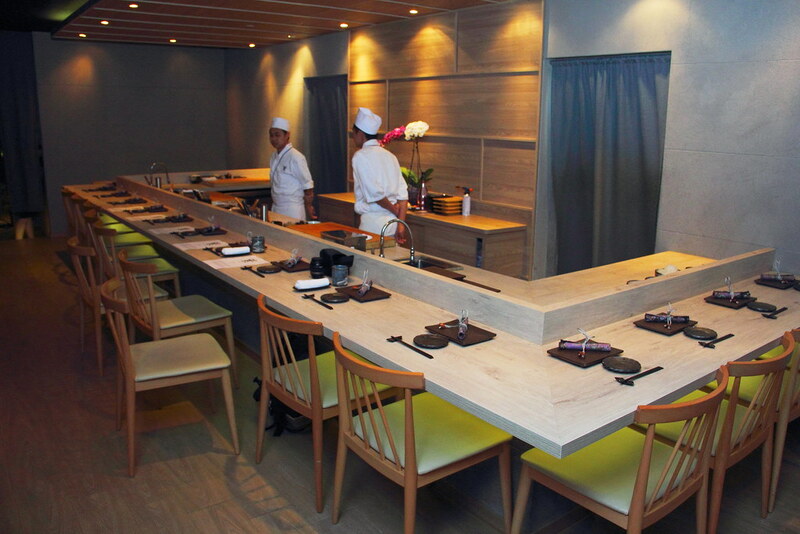 If you have realized, the dishes at Sushi Murasaki is actually quite rich in taste. It is fitting that a bowl of soup is served right at the end to cleanse the palate. 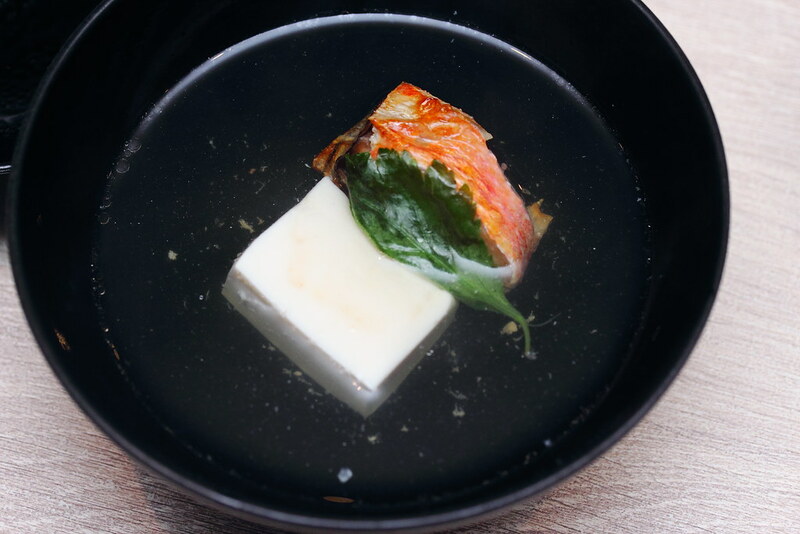 The kombu and bonito soup comes with tofu and grilled golden eye snapper fish cheek. A smoothing ending to the dinner before dessert. Wrapping up the dinner is the Milk Tea Creme Brulee. Another interesting twist from the normal creme brulee. 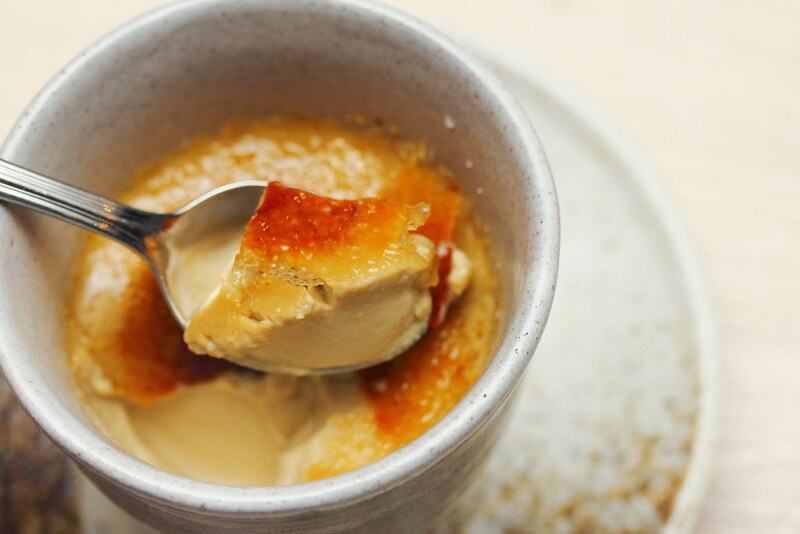 The bitter sweet of the caramelized sugar with the creamy custard work harmoniously for a delightful end to the night. Overall I have enjoyed my omakase experience at Sushi Murasaki. 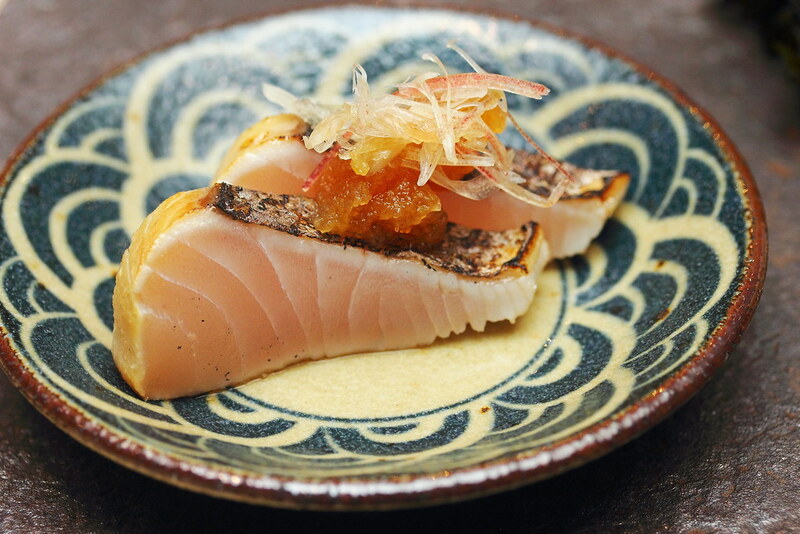 At Sushi Murasaki, the approach in handling the freshly flown ingredients from Japan is towards modern fusion technique, incorporating other elements to elevate the whole experience of Japanese cuisine.